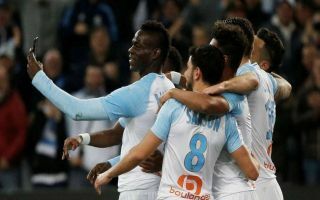 Marseille striker Mario Balotelli wants his Instagram live celebration against Saint Ettiene to be added to this year’s edition of FIFA. The former Inter Milan and Manchester City striker scored a fantastic bicycle kick during Marseille’s latest Ligue 1 victory over the weekend, before wheeling away to perform a unique celebration at the Orange Velodrome. The Italian star grabbed a mobile phone from one of the cameramen behind the goal and asked all of his teammates to join him in a selfie on the side of the pitch, which was streamed live on popular social media platform Instagram. The celebration quickly went viral and was the main talking point after Marseille’s 2-0 win over Saint Ettiene, which saw the team stay within touch of the final Champions League spot in the league table. Balotelli’s now infamous antics for the French giants have been the subject of discussion around the football world at the start of the week and he is aiming to capitalise on the publicity by requesting that EA Sports add his celebration to FIFA. Balotelli was not the first man in history to use a phone as a prop during a match, however, with that unique record belonging to legendary former AS Roma striker Francesco Totti. The ex-Italy international scored a brilliant volley during the Rome derby against Lazio back in 2015 and he celebrated by taking a selfie which his fellow countryman has clearly taken inspiration from. FIFA celebrations have become rather stale of late and Balotelli’s latest creation could help to liven things up, but it remains to be seen whether or not EA Sports will answer his call.